Our opening chapter recorded that, during November 2012, ENRC began trial shipments of 300,000-tonnes a year (tpy) of iron ore from its BAMIN mine in Caetite, in order to confirm some of the “major operational assumptions for the potential DSO [Direct Shipping of Ore] phase and to update its bankable feasibility study of the project”. By then ENRC was still reviewing a “different phasing of the project, including a scenario with an early revenue direct shipping ore phase over the next three years, utilizing the existing railway and port infrastructure” [Steel First, 17 May 2013]. Just over a year later, in June 2014, BAMIN was given an operational licence, valid for three years, which allowed it to produce up to one million tpy of ore from the Caetite mine, and to transport this using the Ferrovia Centro-Atlântica (FCA) railway “until the completion of Tubarão port in the country’s south-eastern Espírito Santo state” [Steel First 18 June 2014]. Just before this, Nostromo Research asked the ENRC/BAMIN head office in Salvador how much ore was being already being sent from the mine, and who was buying it. No reply was received . However, on a field trip to Caetite, carried out by two Brazilian researchers and this author at the end of May 2014, we observed over-burdened trucks exiting the mine each day. On following these, we found their cargoes were being offloaded to a storage point, then onto rail wagons at the FCA railhead in the town of Licinio de Almeida. 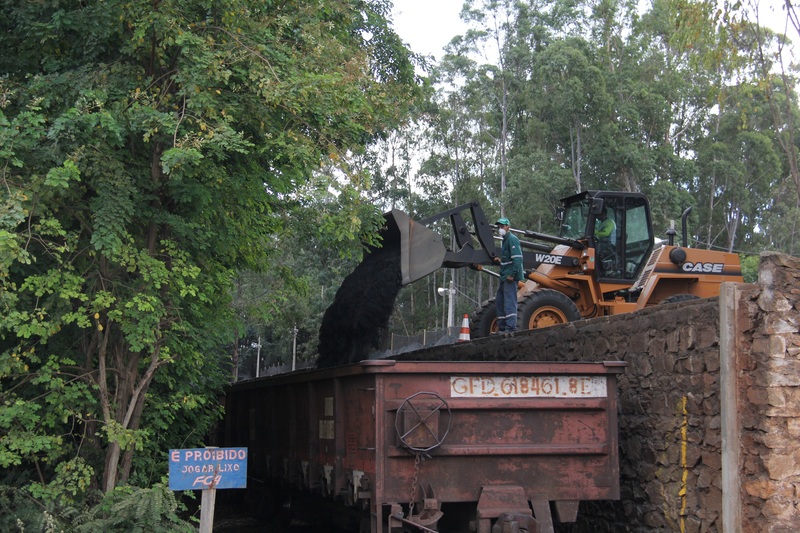 From there, according to station staff, this ore was railed to a port in Espirito Santo state. We calculated that customers could indeed be receiving about 300,000 tonnes a year from the mine, as envisaged by BAMIN in late 2012, although this does not account for any proportion of the ore that might be stockpiled in Espirito Santo itself. ENRC is very tight-lipped about its current customers. This is hardly surprising, given the allegations of mismanagement and corruption which started swirling around it by early 2013, and have by no means gone away. The company seems not to have published any data on contracts since 2012; it’s likely that at least one contract is still being met, but largely from mines in Kazakhstan, and other sales are concluded on a “spot” basis. ENRC’s main iron ore customer during 2011/12 was the huge MMK (Magnitogorsk Iron and Steel Works OJSC). This Russian steal maker bought 50% of ENRCS’s global iron ore output under an arrangement which the Kazakh company announced would last “until 2017 at least” [Steel First, 21 June 2011]. In its 2012 Annual Report, ENRC confirmed that, during the previous financial year ,it had sold the majority of its iron ore in the form of pellets “predominantly to MMK and to steel producers in North West China”. The figures given were: 9.9 million tonnes to Russia; 5.5 mt to China, with the remaining one million tonnes being sold within Kazakhstan [ENRC Annual Report 2012]. The company added that, “due to lower contractual volumes of iron ore supplied to MMK”, it had agreed with a second Russian steel smelter, JSC Chelyabinsk Metallurgical Plant (MECHEL), “for the supply of iron ore concentrate, with pricing based on monthly agreements”. Moreover, it said that: “The contractual prices with the Group’s main Chinese customers are determined on a quarterly basis” [ENRC Annual Report 2012 ibid]. It cannot be verified that BAMIN itself supplies any of these. And it’s unlikely that BAMIN is currently – or will ever be- supplying substantial amounts of beneficiated ore to any Brazilian smelters, especially in light of Vale’s predominant role in satisfying domestic demand and a lower cost involved in upgrading the ore. Converting iron from its natural state into metal acceptable to steel manufacturers necessitates a significant number of processes which vary in complexity, depending on the type of ore and what buyers need to use it for. Once the ore has been wrested from the earth, it is crushed, ground up and “beneficiated”, in order to significantly increase its original iron (fe) content. This may involve magnetic separation and flotation – requiring large amounts of water drawn from the surrounding area.. It stands to reason that delivering a product to market with a 62% fe grade, originating from raw material grading at only 32% fe or less, leaves a vast amount of waste behind, dumped at or near the mine site. The refined ore is then transported in the form of lumps, pellets or fines, and may be upgraded further at a port before being sent overseas. (A further chapter of this work will examine the implications of using these technologies in relation to the Pedra de Ferro project). It’s by no means a simple task, and one that can be adversely impacted upon by numerous unforeseeable events. These include a sudden fall in market demand, storms and flooding, a collapse of mine workings, labour disputes and strikes, and – not least – growing local peoples’ resistance to one or more aspects of the operation. BAMIN’s prospects of eventually succeeding in lifting and carting off as much as 20-25 million tonnes a year of iron ore between Caetite and the Atlantic Coast are decidedly uncertain. Where, then, might ENRC be searching for such customers? Were constantly told that the world’s two most populated nations, China and India, have embarked on a neo-liberal economic “development” path, unprecedented in human history, which is largely aimed to satisfy the pretended needs of a rapidly-rising middle class. “Continued urbanization and industrialization in large markets such as China and India is expected to prop up demand for iron ore…As per a report by McKinsey, China’s urban population is expected to rise by about 350 million by 2025. India is expected to add 215 million to its urban population by 2025. These trends in urbanization and industrialization are expected to drive up demand for iron ore over the coming years” [Forbes magazine, 19 May 2014]. According to Statista, a global statistics portal, China in 2012 was not only by far the largest importer of seaborne iron ore (accounting for some 70% of the global total, followed by Japan, western Europe, South Korea and other Asian countries. It will also remain so for at least another three years [Seaborne iron ore demand 2012 and 2017, Statista, accessed in August 2014]. These bullish projections are music to many ears – not least, those belonging to corporate mining heads. But there is another tune now being played. Arguably more sanguine and better-informed analysts contend that this iron ore boom is essentially illusory. What they are warning about may seem unnecessarily alarmist, if not downright counter-intuitive. After all, the world’s three leading exporters of iron ore – Vale, Rio Tinto and BHP Billiton – recently bumped up their mining of higher grade material to unprecedented levels. Why ever would they do so, unless they were satisfying genuine need? None of these firms seem to doubt that their production will find buyers in the longer term . In reality, much of the iron ore they have delivered in recent months has ended up in stockpiles, bought by steel companies taking advantage of falling costs. A great deal of it has been sitting idle in ships anchored off the Chinese coast – to the extent that, in May 2014, Business Spectator reported that iron ore inventories at China’s ports reached no fewer than “a record 113.3 million tonnes” [Business Spectator, 29 May 2014]. (Around five times the amount that BAMIN plans to deliver each year at full output, from its Caetite mine). In short, an already over-supplied market is now awash with the stuff. Prices being paid for it have toppled. dramatically. Consequently, numerous smaller miners of poorer quality, lower-grade, ore (and not only those in China) have been put to the wall. As David Humphreys ( for eight years the chief economist of Rio Tinto) noted in August this year : “With iron-ore prices below US$100.tonne, a large part of China’s small-scale private sector production is under water…80 million tonnes a year (more than 20% of the total) could close this year” [Mining Journal 29 August 2014]. But such attrition doesn’t worry the Big Three iron ore producers in the slightest; on the contrary they are more than willing to step in and supplant those failed suppliers. ” The iron ore price continues to sink under the weight of two reinforcing influences, neither of which appears likely to abate any time soon. “The original crack in the price two years ago was due to softening demand for China as its authorities wrestled with an over-heated economy and financial sector. “There’s no reason to believe China is going to bounce back to double-digit-growth rates, with the authorities determined to pursue more stable and higher quality growth, so the demand side of the iron ore equation is unlikely to change dramatically in the foreseeable future. “As we know from the major iron ore producers’ production reports, their supply has increased dramatically and will continue to increase dramatically as they look to higher volumes and lower costs to offset price declines. ” It may well go lower over the next year or so as the additional volumes enter the market. Rio, BHP and Vale aren’t going to be overly concerned, given that their cost bases are already at the lower end of the sector’s cost curve and are still reducing. Everyone else, however, is going to be worried. “Prices have fallen 30 percent since the start of the year to about US$95 a tonne, prompting the big miners and analysts to predict a restructuring of the global iron ore industry. Commodity supplies rise, the price goes down, weaker producers exit the scene, and a more sensible arrangement emerges, with buyers settling contracts with producers, reflecting a more equitable relationship between them. This has happened on two occasions in the iron ore market over the past decade. Why shouldn’t it happen again? The reason it won’t is that Beijing’s over-arching socio-economic and anti-pollution priorities have noticeably shifted into a higher gear, and the regime is implementing the “cooling” of domestic growth on a scale never seen before. There are problems, of course. Shutting down hundreds of Chinese mines is comparatively easy – it may be done literally over night on orders of the government. But the administration has still to contend with a huge social problem of providing jobs for hundreds of thousands of ex-miners. As the Business Spectator said in May this year: “[S]ome of China’s mines are co-located and integrated with steelworks [so] they won’t be shut down, and …there may be social pressures to maintain sub-economic production. “It could…be an increasingly nasty and destructive few years for everyone in the sector because the big miners will still be bringing new tonnes — and a lot of them — into the market towards the end of this decade. “It is the big and continuing increase in production that has occurred since 2012 and the changes in China’s economic policies and settings that suggest that this time, history is unlikely to repeat itself with a quick bounce-back in the price.” [Business Spectator 21 May 2014]. We should also mention another important factor (largely ignored by the outside world) that significantly contributed to China’s apparently insatiable recent demand for iron ore, and one which the Beijing leadership is belatedly addressing. Until recently, a significant proportion of both iron and copper were being used by Chinese banks as collateral for other trading transactions. The loans were used principally to sustain the country’s hugely excessive building spree, resulting in thousands of apartments and office blocks remaining empty and unwanted. The government stepped in to halt the playing of this “iron ore game” and the price quickly slumped, as banks scrambled to offload their iron ore stockpiles [Business Spectator 14 June 2014]. Regaining fiscal control over wayward banking may not have been the sole objective in making this move According to mining.com: “[I]ron ore was hit… because apart from the credit clampdown China is also targeting the steel industry’s chronic overcapacity and environmental impact as part of its ‘war on pollution’ ” [mining.com 8 June 2014].. Many people will doubtless remain committed to the conventional “modernisation” model, envisaging a galloping use of minerals and metals by states endeavouring to “catch up” with much more refined economies of north America, Japan and western Europe. Clearly it’s naïve and foolhardy to believe that steel manufacture will, any day soon, cease being a key – perhaps the key – building block in the development scenarios propagated by Asian, African and other states. This is especially true for Brazil, Russia, and South Africa, joined with China and India in the BRICS economic bloc and which, in March this year, launched their own development bank, similar to Brazil’s BNDES. It would be foolhardy to think that China is suddenly going to break away from BRICS and dramatically curb its rate of industrialisation. On the other hand, the country is already the world’s leader in promotion of renewable energy sources, and this will have an impact on the amount and type of raw materials it imports, including iron for steel. Meanwhile, Chinese firms continue to search for foreign iron ore mining opportunities. For example, just this July, the China’s largest steel maker, Baosteel Resources, along with an Australian rail operator, Aurizon Holdings, made a compulsory US$7 billion bid for the Australian firm Aquila Resources Ltd, whose Pilbara iron ore lease in West Australia could mine and export 33 million tonnes of high-grade iron ore a year when it reaches full output [ Reuters 9 July 2014]. Nonetheless, it’s reasonable to assume that this kind of China foraging overseas is slowing down, leaving its steel makers to rely primarily on large, established and reliable producers of high quality ore.
India is the world’s second largest “developing nation” and its population may soon rival, or even exceed, that of its northern neighbour. The manner in which successive governments (central and state) deal with its own egregious heritage of industrial pollution and community displacement stands in marked contrast to that adopted lately by China. Indeed, with the election of Narendra Modi from the right-wing political party BJP in May this year, it’s more than likely that the indiscriminate mining of many materials will rapidly increase, along with imports. However, there is one possible exception to this scenario and it’s down to the conclusions reached by a recent government Commission. And it centred upon India’s profligate mining and export of iron ore.
Until recently, India’s domestic production of iron ore was sufficient to feed most its own requirements – indeed the country exported significant tonnages. Virtually all these exports were destined for China, and the main ports used were situated in the “holiday state” of Goa, only a short travelling distance from the mines themselves. Numerous allegations had been made over several years that mining had spawned rampant exploitation and violation of environmental safeguards; that companies had signed numerous corrupt contracts, and engaged in illegal exports between 2008 and 2011. The government finally stepped in with a judicial enquiry. Following more than three and a half years of investigation, this Shah Commission delivered its final report to the central government in July 2014, and its findings were broadly accepted. By then, all (sic) iron ore mines in Goa had been closed, along with many others in the state of Karnataka. Although some operations have since been granted permission to re-open, it will be a long haul before they become productive, while India’s output of iron ore will probably never again reach anywhere close to earlier heights. In fact, the forecast for Indian iron ore exports during 2014 is just 22 million tonnes – a far cry from the figure of 120 million tonnes in 2009.. As mining.com points out: “[The] Indian [iron ore] industry collapsed amid a government corruption crackdown and miners from the subcontinent abandoned the export market [leaving it] now dominated by seaborne ore from Australia, South Africa and Brazil” [mining.com 8 June 2014]. It’s too soon to write a death certificate for India’s iron ore sector, but it’s clear that, for several years to come, the country will predominantly rely on imports. Indian steel companies are now busy trying to “mop up” much of that surplus global excess largely being mined by “The Big Three” companies. If a a much smaller and much less capable outfit like BAMIN believes it can easily meet Indian demand, it should think again. Precisely because there’s so much material out there, now looking for customers, what it can offer looks distinctly insignificant. On economic grounds alone, and even did BAMIN quickly raise its output of around 300,000 tpy from Caetite to one million tonnes, this would hardly provide enough capital for ENRC to use all the infrastructure envisaged in the original Pedra de Ferro proposal; and in particular, the construction of a new port of Porto Sul, albeit that it would be shared with other users. Yes, BAMIN might try to do deals which undercut other miners. It might do so if were already delivering 15-20 million tonnes of low cost, high grade ore a year, having fully secured access to all the infrastructure required to make the Pedra de Ferro scheme a reality . With barely a single slingshot,the Goliaths may have delivered the fatal blow to Bahia’s little David. * Predictions of future global demand for iron should account for the potential rise in global metals’ recycling rates, the re-use of metals, and substitution of steel for other metals – notably aluminium. These conservation strategies are gaining ground.